DNS Keeper is supposedly a tool that will unblock websites that were previously inaccessible, because they were blacklisted by governments or Internet service providers. Unfortunately this program does not work as advertised. We consider this program as adware, because its main task is to display commercial advertisements, and for this reason you should remove it. This application is deceptive and is of no use to anyone. DNS Keeper will only hinder your browsing session with unasked-for ads, which are irritating and might even be dangerous, because they could promote malicious downloads and fictitious online shopping websites. Deceptive adware applications are not that common. In most cases, adware applications promoting websites state that a program improves your shopping experience, helps you save money, shows you the best deals, and so on. But DNS Keeper is different. Not only will it show you advertisements, but it will not perform the tasks for which you installed it. DNS Keeper has been released by a software developer known as GreenTeam Internet Ltd. Not much is known about this developer. It has its own website at Greenteamdns.com, but it seems to be more of a façade than a legitimate website. DNS Keeper sort of has a twin brother called DNS Unlocker. So, to date, GreenTeam Internet Ltd has rolled out two adware programs that we know of and we will surely be keeping an eye open for more of its releases. In any case, the program is promoted on a website called Vidpot.tv, but it does not feature a download of it. We think that the application might be distributed via websites that host downloads of pirated material. Now, let us talk a bit more about how this application works. 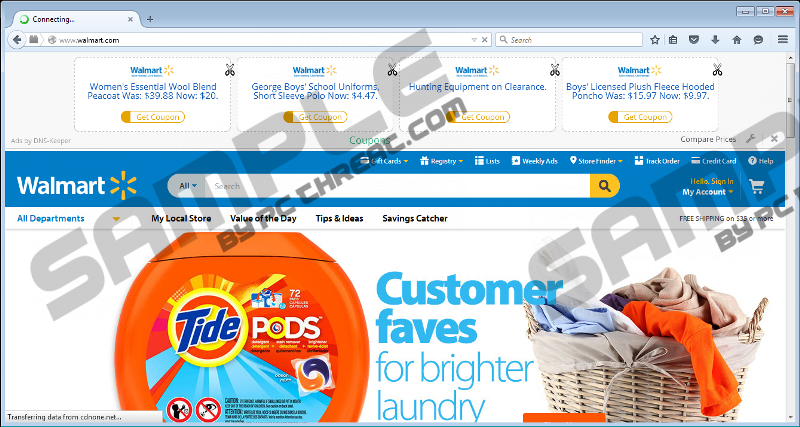 While testing DNS Keeper, we found that it displays commercial advertisements on online shopping websites, such as Walmart.com, Amazon.com, and Ebay.com. The ads are not very intrusive. Most of the ads that we saw were coupons and banners that can be distinguished by their label “Ads by DNS Keeper.” The application features a price comparison feature, but it does not seem to work, and why should it when you did not even want this program? For the most part, the ads appear on legitimate online shopping websites. However, we think that they might also appear on random websites, and might promote fictitious online shopping websites or malicious applications that pose as legitimate programs, just as DNS Keeper does. DNS Keeper does not unblock websites, but rather displays advertisements. Clearly, that is not a sign of a reliable application. For this reason, we recommend that you remove DNS Keeper from your computer using the guide provided below. However, in order to fully remove this program you will have to perform complex removal actions that should not be attempted by inexperienced PC users. There is no room for mistakes, so, if you are not sure whether you are capable to to get rid of it manually, then you should use an antimalware program to do it for you. Out of the many applications you can use, we recommend getting SpyHunter, since it is more than capable of dealing with this particular infection. Find DNS Keeper and click Remove. Find DNS Keeper and click Uninstall. Tap Windows key+R on Windows XP, Vista, 7, 8, and 8.1. Enter regedit.exe in the dialog box and click OK.
Find Local page on the right side of the window, right-click on it and click modify. Replace the Value data with C:\Windows\system32\blank.htm. Enable Show hidden files, folders, and drives. Find DNS Keeper's hidden randomly named hidden files and delete them. Quick & tested solution for DNS Keeper removal.